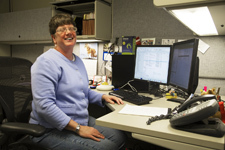 What that means: In her current role Griffin manages the Visual Zen (VZ), a vendor-based registration system that serves approximately 10,000 students and guests per year, plus an additional 40 KU staff in offices such as First-Year Experience and the Undergraduate Advising Center. Along with VZ, Griffin manages other systems, such as Hobson’s CRM and TIS for the Office of Admissions. Notable: Griffin makes it a point to understand the needs of her on-campus colleagues and how they can best use systems. The ability to make technical details easy to understand for nontechnical staff is an invaluable talent and demonstrates the extent of this individual’s communication skills. With the creation of the Office of First Year Experience and its evolution over the past year and a half, Griffin has worked closely with staff to ensure that orientation registration, reports and numbers run smoothly. Griffin has taken time to meet with new staff and give them an overview of what she does with regard to the VZ system. What that means: Meinecke oversees the daily operations of the ceramic and sculpture areas for the Department of Visual Art. Notable: There are many moving parts of this job, requiring Meinecke to work successfully with a wide range of individuals. He works side-by-side with staff from Facilities Services when they come onsite to fix a problem. 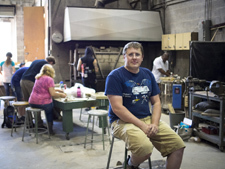 He works in tandem with instructors to demonstrate techniques, and he works with students to build and maintain kilns and other ceramics equipment. A major bonus for the unit is that Meinecke has a master’s degree in fine arts, which allows him to advise students about materials and processes. He is an expert with ceramic glazes and kiln firing but can just as easily switch gears and perform welding or other maintenance tasks to keep equipment fully functional. Meinecke is a rare combination of technical master and capable teacher.